Location of Bangalore : Karnataka. Significance : Capital Of Karnataka. Bangalore was Founded by : Kempe Gowda. Languages Spoken in Bangalore : Hindi, Kannada, Telgu, Tamil, English. The multifaceted capital city of Karnataka, dotted with modern marvels, lush boulevards, historical monuments & bustling shopping plazas, Bangalore, aptly called the Silicon Valley of India, is every tourist's dream travel destination. Bangalore, the fifth largest city in India, is the perfect blend of natural beauty and man-made marvels of architecture and technology. Blessed with a salubrious climate and dotted with beautiful parks, its tree-lined avenues, its trendy, yuppie downtown, and the software flood, Bangalore truly offers one a picture of striking contrasts. Bangalore - located 1,000m above sea level is one of the most 'happening' places in India. Bangalore, which literally means the 'town of baked beans', was founded by Kempe Gowda, a chieftain of the Vijayanagar Empire, around the 16th century. He built four towers in four directions to specify its boundaries. However, Bangalore has far exceeded these limits since. » The Bull Temple - The 4.57m high and 6.10 m long image was built by Kempe Gowda, in the 16th century. 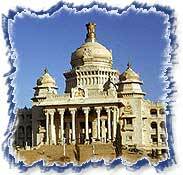 » Vidhaan Soudha - A marvel of neo-Dravidian architecture and one of the most imposing building not only in Bangalore but in India, the Vidhaan Soudha houses the state legislative assembly of Karnataka and part of the Secretariat. » Tipu's Palace - The summer palace of Tipu Sultan was built in Bangalore. The entire structure is built of teakwood. This double-storeyed ornate structure was constructed in 1781-1791 AD. Bangalore is famous for the shopping malls, which have some of the finest and biggest showrooms in India. This electronic capital of India has been attracting people for Sandal wood, Silk and hand woven materials. » Ramohalli - This picnic spot is located 28 kms from Bangalore on the Mysore road. Ramohalli is a beautiful picnic spot with a KSTDC restaurant. » Mysore - The erst while capital of the Wodeyars is 140 kms from Bangalore. This city has retained the charm it had acquired during the reign of Wodeyars. Mysore is also known as the 'City Of Palace'. » Hassan - 194 kms from Bangalore is Hassan, from where one can go to Belur, Halebid and Sravanabelagola. 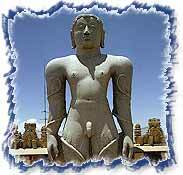 Sravanabelagola is a famous Jain pilgrimage with a 17m high monolith of lord Bahubali standing tall. Bangalore - The Silicon Valley of India and every tourist's dream travel destination is well connected with domestic airlines and also catering to few international flights. Bangalore, being the capital , has excellant road services to adjoining states and has a strong network of rail services with two major stations the Banglore City and Banglore Cantt.